Can the height of the chinese altar be 60cm or 4feet 8inches? Is this a standard height we can find in singapore? 1. If one buys off-the-shelf altar table; most of such "standard" tables have a height that is around 49 3/4 inches or 126cm. Often, such standard table(s) height is between 125 to 128 cm which is perfectly OK or acceptable. 2. But you wrote "60cm"? 60 cm is close to 2 feet. Usually, this 2 feet has to do more with the width of the (altar) table. But, 60 cm is too short for an altar? 3. 4 feet 8 inches = 56" or 142.5cm which is inauspicious. If so, the net best range is either 132cm to 134cm or higher at 145cm to 147cm or 5 feet. 4. Basically, for an altar table; and if one were to use the Feng Shui ruler; both the top - yang measurement should be red. and the yin or lower measure should also be red. (Both top and bottom range should be in red) as a guideline. Currently my home is custom made an altar. 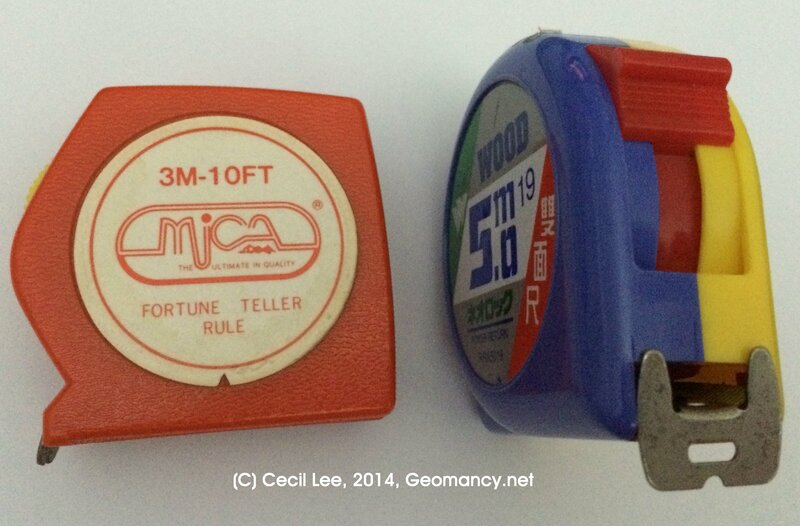 I have measure my own using the normal ruler. From the floor to the table is 136cm to put my Kuan Yin God sculpture. But according to my old altar which I bought it from shop is only 126cm and it does matches with your measurement. My question is 136cm is that an inauspicious height? I am actually asking the ID to change for me cause I feel is high. Is about 10cm different and she said is a feng shui measurement. Can you teach me how to measure using feng shui measurement? According to you when top and bottom of the ruler reach red is good?? Besides, for the ancestor I have measure is 133.8 using the normal ruler. 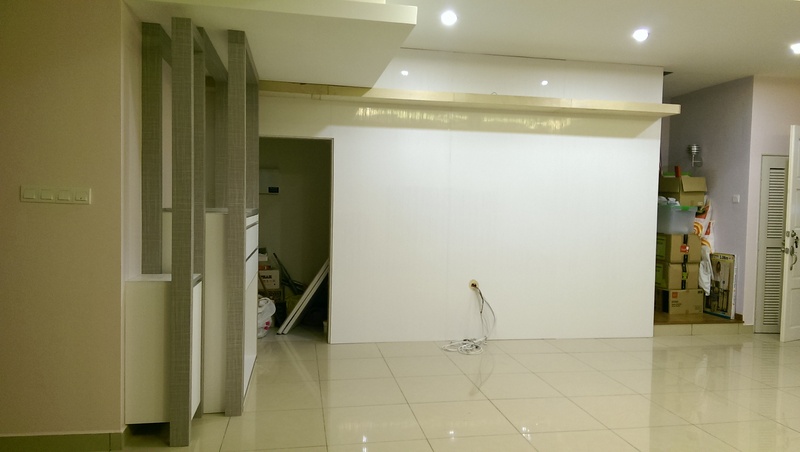 Mind to ask what is the best measurement for the height from the floor? Master Cecil Lee, the whole altar I measure using normal ruler tape. 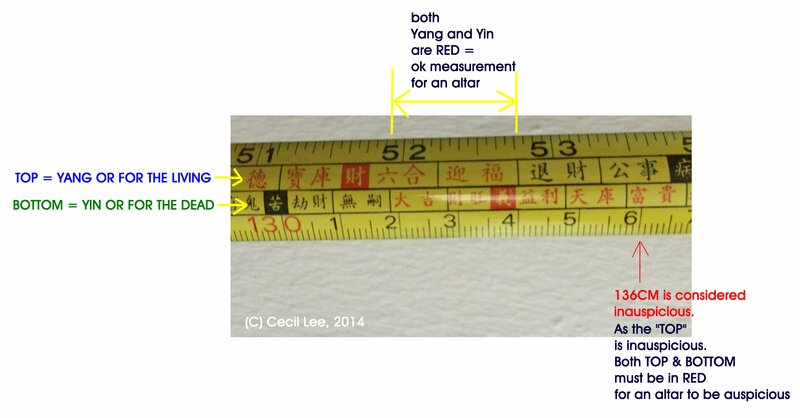 I just found out that even I measure from the floor but the custom made altar there is a few inches high before the 'dei chi gong' (God of deity??) table. So the measurement 136cm is still inauspicious from the floor? Should I remeasure from the 'dei chi gong' (God of deity) table? Usually the table is consider floor to us as standard unit purchase from shop does not have extra bottom. that is around 49 3/4 inches or 126cm. "60cm"? 60 cm is close to 2 feet. yin or lower measure should also be red. 1. Please refer to the two attachments. 2. As a rule-of-thumb; an altar "must" or try-to have dimensions that have both the "TOP" and "BOTTOM" (see right side of either illustration) in RED. 3. The TOP line is meant for Yang dimensions or for the Living. 3.1. 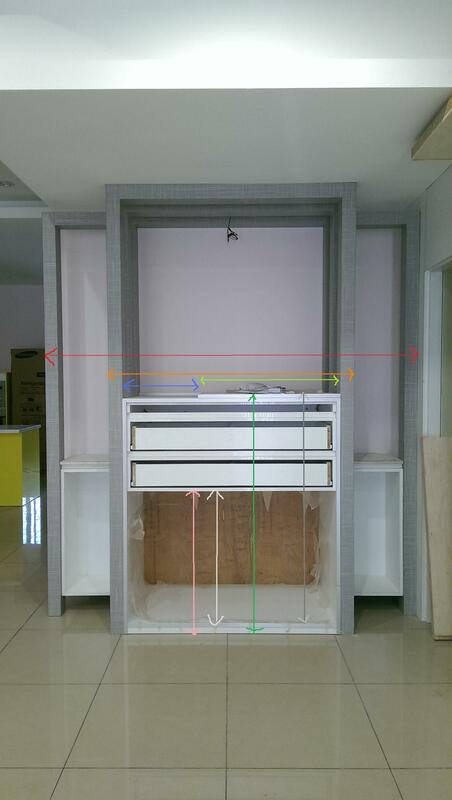 Thus, if one wants to use auspicious Feng Shui dimensions for say a working table or height of a kitchen table; then one can look at the top line and any measurement in RED (auspicious). 3.2. Of course, there is no harm for any human living being furniture in both top and bottom = red. 4. The "BOTTOM" line is meant for Yin Feng Shui. Or Feng Shui for the dead. Such as for a tomb or coffin. But of course, Yin also refers to "the other side". 5. For an altar table; it is suppose to be IN HARMONY with the living (Yang = TOP) and (Yin = BOTTOM) as shown on a Feng Shui ruler. 6. Thus generally, if we buy a "standard - off the shelf" altar, most would generally conform to the TOP and BOTTOM in RED. 7. After around 126cm, the next best lower measurement is around 42". But this is not a safe height as a two year old or three year old child may have the height and hands to swipe the entire altar. 8.1. We all know that some may add a piece of glass on top of this altar. And this may altar the height. No worries as the altar table can easily also accept between 124.1 cm to as high as 128 cm. Thus even if we add a protective glass on the altar; it will also be auspicious - if the glass is not so thick to exceed this measurement. 8.2. For some altars, they also have a table top (when standing looking at it) the ancestor table top is to the left of this full altar. And if the altar is say at 126cm; the ancestor table top is slightly lower and thus can be say 125cm and still be auspicious. 9. Your question was 136cm auspicious = No, it is inauspicious if we go by the Feng Shui ruler measurement. Please see one of the attachments. measure using feng shui measurement? is still inauspicious from the floor? acceptable.2. But you wrote >"60cm"? 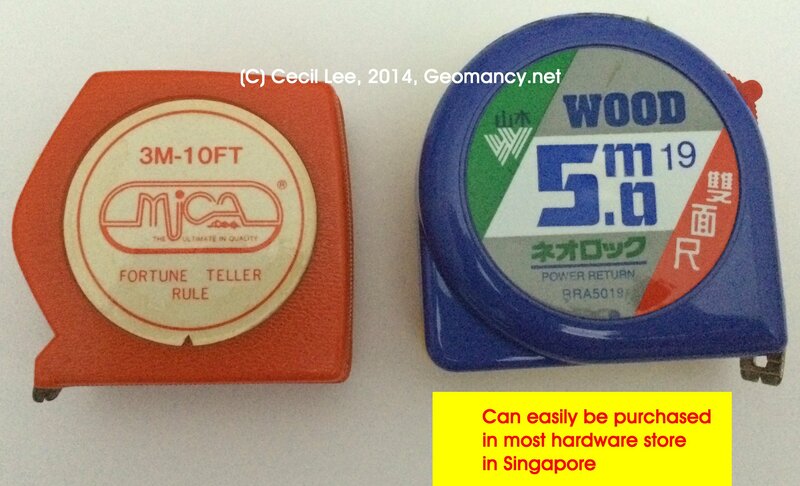 The Feng Shui ruler on the left of the photo can easily be purchased in most (many) hardware stores around Singapore. have dimensions that have both the "TOP"
and any measurement in RED (auspicious). 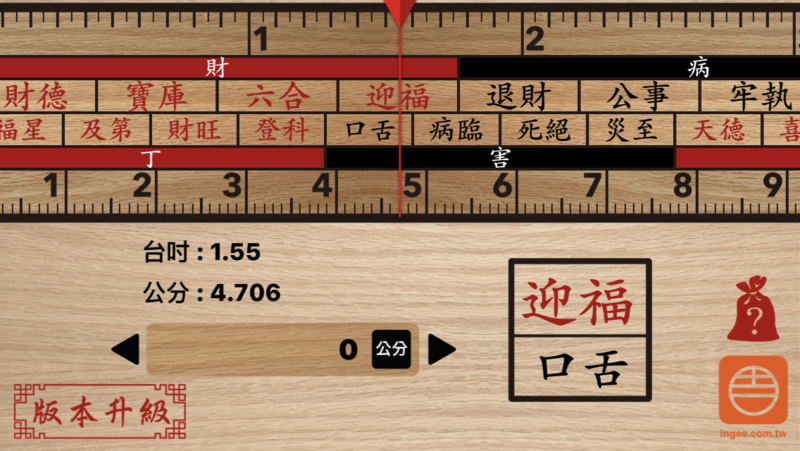 BOTTOM) as shown on a Feng Shui ruler.6. best lower measurement is around 42". between 124.1 cm to as high as 128 cm. 60 cm is close to 2 feet. cm is too short for an altar?3. I want to confirm with you regarding the altar measurement. I am redo a custom made altar. As attached is the picture of the wrong doing feng shui measurement for the altar. I am confuse where to measure a correct way to give it to the new carpentry. So far Iunderstand that in general I must meet the feng shui ruler yang in red in colour wording and yin in colour wording too.Is it measure from the end panel to end panel or table end to table end as attached the picture? Which is correct if is a same design altar? Can the design create in pillar as showed attached? You wrote: "Can the design create in pillar as showed attached?" 1. The best to understand this is to look get a clue from the past. 2.1. 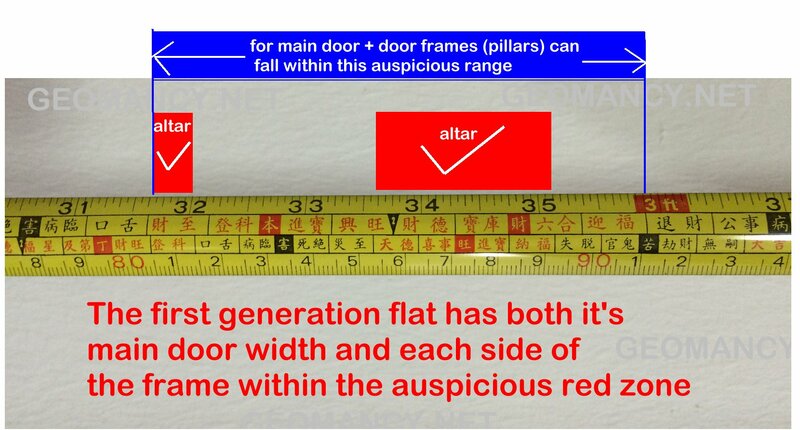 The main door has auspicious measurements that falls in the red. 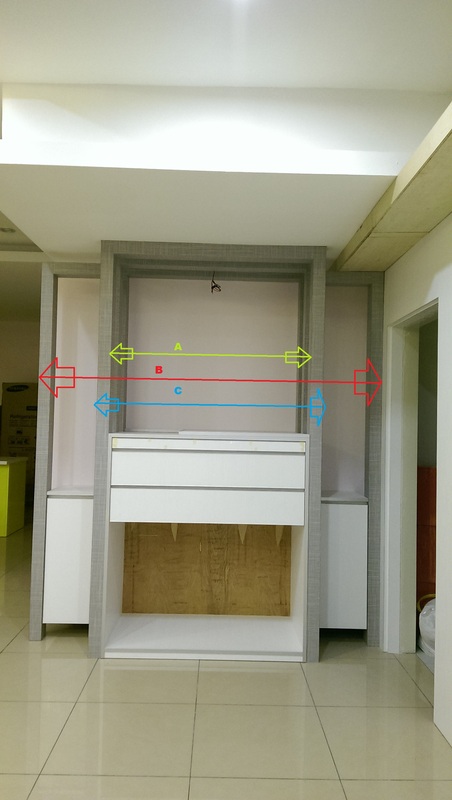 Since this is the main door; and for Yang Feng Shui; there is a range of measures on the Top between 80.5 cm to 91 cm that is considered auspicious. 2.2. All these HDB flat's main entrance door takes advantage of the above; by having both the main door within the auspicious dimension and also it was remarkable that both sides of the main door's frame or in your case the "pillars" also within this auspicious dimensions. 3. Thus, if one can "have the pie and eat it all" as mentioned in the above is good or great! 4. If you can find a range of measurement that the interior space is auspicious; plus the frame outer measurement is also in the red for both the top and bottom measurements - since this is an altar would be wonderful. 5. Please note that the above (para 4) is NICE-to and not a MUST-do. But at least the internal space or table top should be in red for both top/bottom measurements. 6. For example, many ready made altar tables comes with a from floor to table top of around 49 3/4 inches or around 126 cm (plus or minus). And even if one were to add a piece of glass to protect the top; the glass can be of a reasonable thickness. So long as it is no thicker than 128cm. Which is pretty reasonable tolerance or variance. Of course, if one intend to recycle a bullet proof glass from a bank's teller glass panel then it may be too thick. Otherwise, most glass is not that thick and even with the glass falls within the tolerance. 7. The idea of having a wide range e.g. if the table top is suppose to be up to 126cm. Even if a mistake has been made by say the contractor; the table can go as low as > 124cm. (see attachment). Thus, such contingencies are built in - if or should any mistake (if any) has been made). 1. In your first posting, I understand that you are already aware that the altar "MUST" have both "reds" in the Feng Shui ruler. If so, then this is good. 2.1. All the FOUR ranges in RED; must have both in RED. 2.1.1. Including the ancestor tablet table top which is slightly lower : this should also fall under both = in red. 2.2. The rest of the other two ranges in Yellow is considered NICE to be in both RED. but if really can't then not as important as Para 1. Thank you Master Cecil Lee. What about Earth God? Should the Earth God have measurement for height and width too? Here attached showed the side viewof my current made altar which is wrong doing. Previous was only front. But according to the side as attached do I still need to follow the measurement by you for the previous attachment name altar dimensions.jpg?? Here attached showed the side view of my current ade altar which is wrong doing. Previous was only front. But according to the side as attached do I still need to follow the measurement by you for the previous attachment name altar dimensions.jpg?? Oops I think I have confused you with thesentence "Here attached showed the side view of my current made altar which is wrong doing. Previous was only frontview. But according to the side as attached do I still need to follow the measurement by you for the previous attachment name altar dimensions.jpg??". I meanat the side view there are two small cabinet box attached with the altar. And there are also three pillars at the left and right side for the design of this altar. Is that auspicious having the three pillar at the both side left and rightand alsoon top of the Kuan Yin God three pillar too? A compact Altar with auspicious dimensions. 80cm is inauspicious. Thus other than the standard measurement of 60cm; Perhaps may consider either 67cm or 68cm instead. 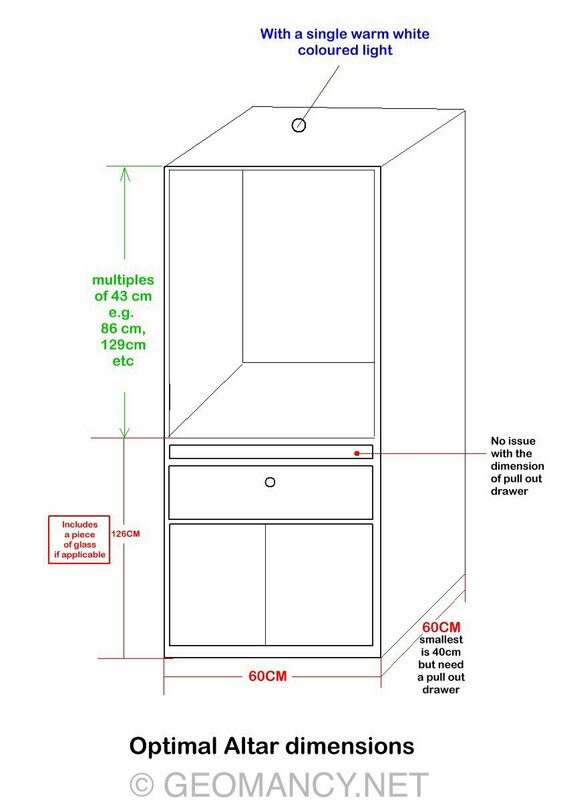 Minimium depth of altar cabinet should instead be 40cm not 30cm. hi, thank you for the information. i will look into the width to be at 68cm, however the height of the platform where the gods sit at 133cm, is it auspicious? 133cm is okay or that 134cm better. Frankly, the most optimum height is 126cm! Another altar taboo is the number of Gods. On an altar, the God(s) must be odd numbers. For example : 1 God, 3 God... hmmm 5 God may be a little too much. Please note that the above excludes the Ancestor tablet. As tablets of ancestors are non-Gods. Hi again, thank you very much for the info. Is it okay for the carpenters to continue working after the gods have moved into the new house altar? The altar, TV console and shoe cabinet (in the living room where the altar is located) is fully completed and ready. As there is a auspicious date given to us, but the contractor is not able to complete the renovations before the date for gods to be brought over. What is left to be done - Installation of Kitchen cabinets (kitchen is separated from living room by glass door & wall), room doors, main door, Installation of ceiling fan & other sanitaryware, final touch up of paints, final clean-up of the flooring & house in general by contractors, and replacement of main gate. After which would be the moving of the belongings and furniture. I will like to ask if I include a glass at the altar table , must it be red or transparent . The background of my table is light green , I want to include transparent glass . Generally, both colours are acceptable. The colour black is however less accepted by many with an altar. I intend to custom made my alter for my ancestor n 三宝公。my contractor Given the measurements is height - L900mm H50 inches can ? However Length 900mm should instead be either be between the range of 88cm to 88.5cm.